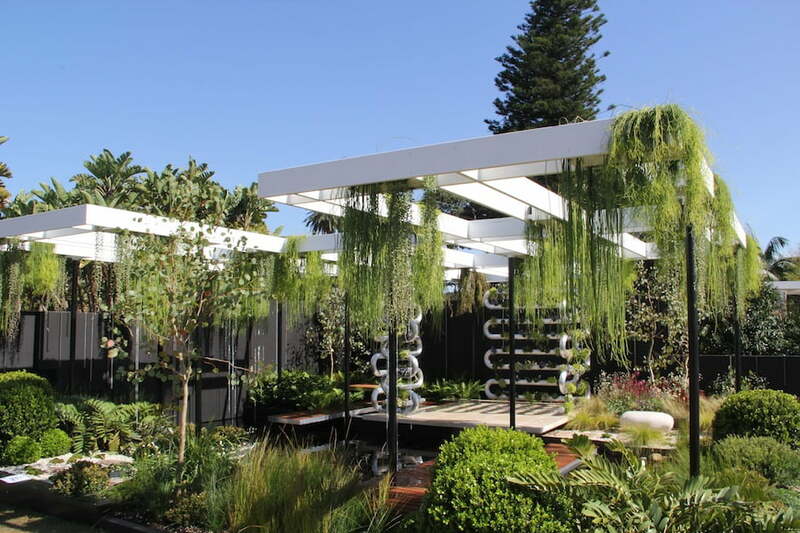 One of my favourite show gardens in recent years was designed by Brendan Moar for the first Australian Garden Show Sydney. 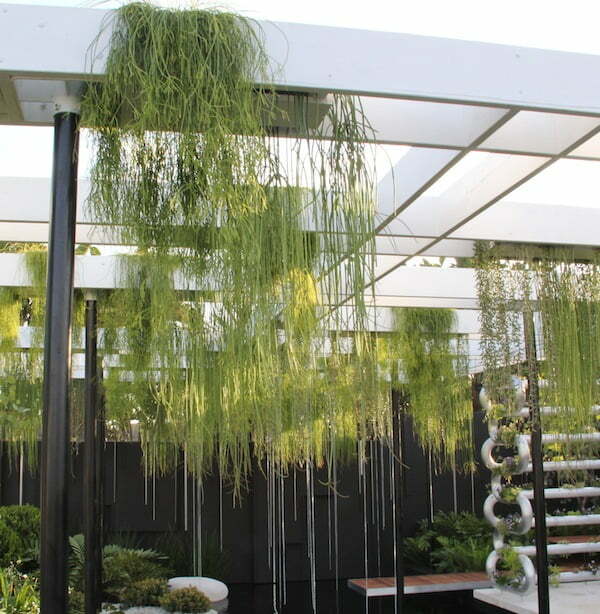 It won Best in Show but what really peaked my interest was how Brendan had incorporated Rhipsalis or mistletoe cacti, hanging them from the pergola to provide a weeping effect. “The hanging plants, suspended, floating and defying gravity are at the heart of the garden”. Mistletoe cacti have made it central stage. Rhipsalis and Lepismium are true cacti, however they do not conform to the imagined cliché – the clustering or tree-like plants that grow in deserts. Instead they generally grow as epiphytes upon trees. These are plants that grow on branches or among mosses and do not parasites or harm their hosts in any way. A few species grow as lithophytes on rocks or cliffs, and a very few grow conventionally in the soil. While they vary immensely, most have cylindrical hanging stems that drape down. And what is the difference between a Rhipsalis and a Lepismium you may ask? This is the territory of the truly devoted and something I was unaware of myself until researching this article. The ovaries of the Rhipsalis flowers are round and the flowers are scentless. The plants show acrotonic branching. The ovaries of the Lepismium flowers are rectangular and they may be scented. The plants display mesotonic branching. Having spent some time travelling throughout South America, I have seen many species growing in the wild. Where there is moisture, the trees are covered in various epiphytes, which form gardens in the sky. Rhipsalis and Lepismium plants are often visible high in the canopy, hanging from horizontal branches. Areas where these plants are highly memorable, include the Rio de Janeiro Botanic Gardens where various species of Rhipsalis and Lepismium plants thickly coat many of the large trees, and the drive up to Tucuman in Northern Argentina where the road runs through rainforest containing trees covered in Rhipsalis plants. While almost all cacti are naturally found only in the Americas, the great exception and ‘riddle’ is the genus Rhipsalis. Species in this genus are found in tropical Africa (Sierra Leone and Ethiopia southwards to Angola and eastern South Africa), Madagascar, Mauritius, the Comores, Mascarene and Seychelle Islands, Sri Lanka and the Indian subcontinent. Migratory birds are though to be responsible for this unusual distribution, which proves just how effective these plants are at distributing their seeds. At one time Rhipsalis and Lepismium were the provenance of the collector. However in recent years I have been seeing more and more of them for sale – a great surprise. Visiting the Newtown Garden Centre in inner Sydney recently, I was astonished to see the size and variety of Rhipsalis and Lepismium plants on offer. 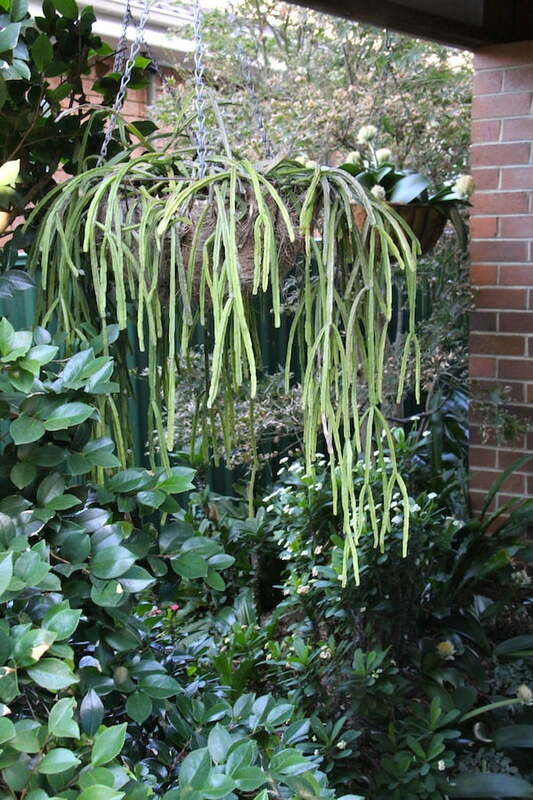 In the inner city, hanging plants have become increasingly popular and Rhipsalis and Lepismium, due to their hardiness and novelty value, are particularly in demand. You may also spot Rhipsalis and Lepismium plants on many of the green walls that are frequently seen in our cities. 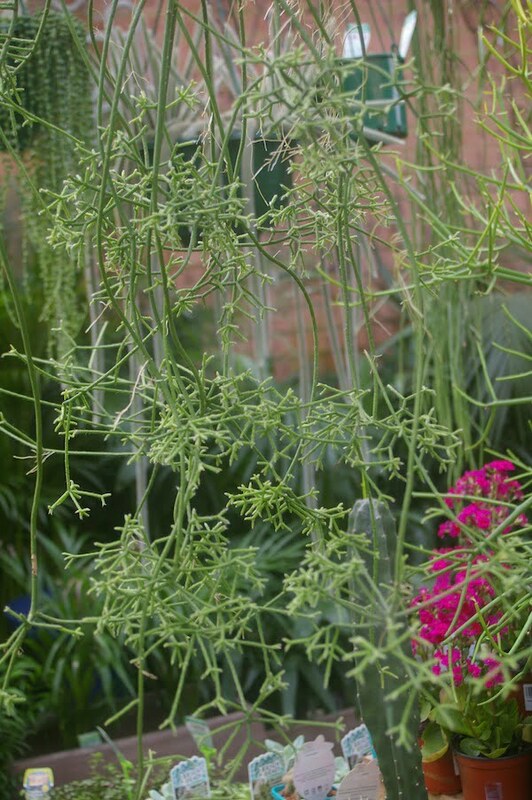 Take a closer look at some of the hanging plants next time you see one. Rhipsalis and Lepimium have always been popular with older gardeners. They are hardy, shade tolerant, tolerate erratic watering and neglect. They are readily propagated and swapped or given away. Many gardeners have no idea what they are growing. The texture of the stems and weeping character is the main attraction however many species have attractive flowers or berries in shades of white, cream pink and red. If you get really interested in locating more of these plants, one of the best suppliers in Australia is Coachwood Nursery in NSW which sells a variety of named species and operates a stand at many garden events around the country. My eyes were really opened to these plants when I visited the garden of Derek and Margaret Butcher in Adelaide. Derek and Margaret are best know for their work with bromeliads (‘Uncle Derek and Auntie Margaret’), however thy have also amassed a great collection of Rhipsalis and Lepismium plants over the many decades. Along with US grower Ken Friedman, Derek has developed a great introductory website to these plants. He has also spent years trying to identify the plants he grows. Like many plants, the flowers are the most useful aid in identification. Many species look identical until they flower. Conversely some plants look quite different from one another but may prove to be different forms of the same species. There are many wonderful species to grow, and many are now widely available – however this will be the focus of another blog. 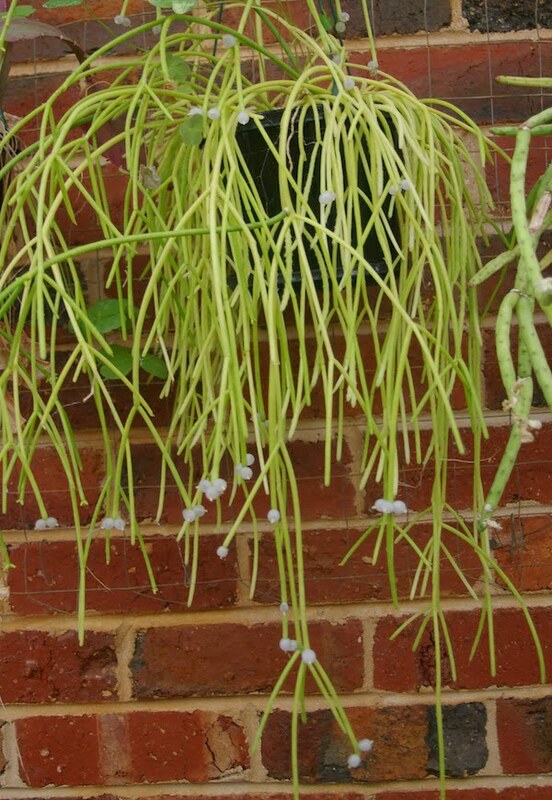 Rhipsalis and Lepismium are very tough and make great hanging basket plants, hung from trees or grown in bush houses. Most plants like a bright semi-shaded location, however some species will grow very well in full sun. 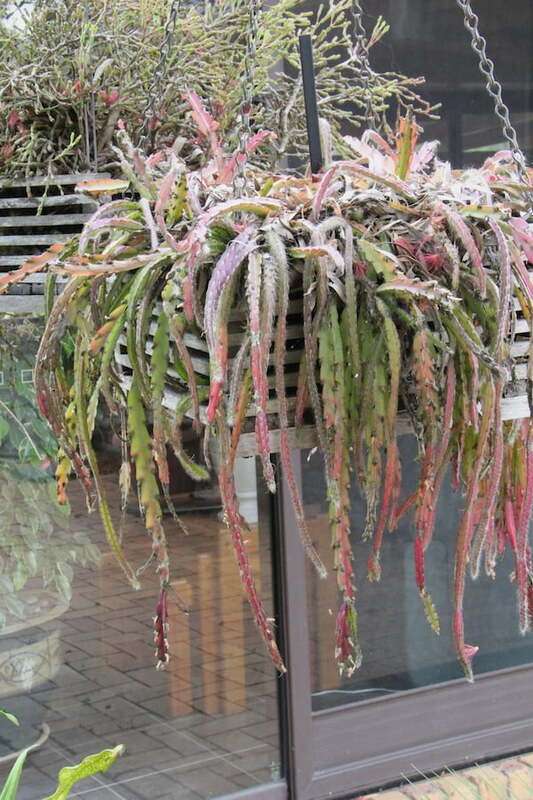 Being succulent, Rhipsalis and Lepismium are hardy and will tolerate dry periods and some neglect. However if plants are well watered and their nutritional needs met, they will grow very fast and look much more impressive. Most species come from tropical and subtropical habitats and grow well in these climates, however I have seen excellent collections of these plants grown under cover in both Melbourne and Adelaide. I grow some 60 species of these plants myself and maintain a labeled representative collection in hanging baskets, grown in standard potting media with a little additional fine gravel. The plants are fertilised with a controlled release fertiliser and hung from trees. These plants provide propagation material with which to experiment and use in other areas of the garden. Plants do well ‘poked’ into the side or bases of staghorn ferns (Platycerium species) or hanging baskets to provide a cascading addition to the composition. Some of the hardier species can also be attached to certain trees, and if well watered initially, can be left to grow as they do naturally in the wild. Some plants make great groundcovers over shaded banks or retaining walls. In the future I intend to use a few more species on experimental green roofs and green walls. Mistletoe cacti can be used imaginatively to enhance our gardens, courtyards and verandahs. They can provide aerial interest, texture and colour. They have proved themselves to be tough and reliable performers. They certainly are becoming more popular, which does surprise me as they are not showy and do not have large colourful leaves or flowers. However they have a wonderful weeping habit, fine textural quality and an interesting character, which can contribute to a stunning garden as demonstrated by Brendan Moar last year. Great Feature Arno .. !! yes these are really getting more visibility now and certainly fit the “designer plant” appearance, with a durable resilience that makes them easy & fun plants as good garden plants too. your use of these plants in some of your gardens has really inspired me. I hope a few more nurseries will start growing them so we can use more of them on our landscape projects. Thanks Arno, loved your article on Rhipsalis, I now understand much more about the plant I love….also the pictures are wonderful. Glad to have inspired you Jude. I’m hoping to do a follow up on the many species around and about some time soon. Thanks for the complements regarding images. Good to hear from another convert. There are lots of species out there. Amazing what you will find in collector’s gardens. Now is the time to take cuttings. Its amazing how fast they grow with warmth humidity and a little slow release fertiliser. Great article Arno, well researched with lovely bits of interesting information. You prompted me to go out and measure my Rhipsalis baccifera, it is 190 cms long. I planted it in a hanging basket in dappled light at least 10 years ago. I follow a very strict and rigorous regime of care for this little beauty… I water it occasionally! I have not fed it, repotted it or removed any dead bits but it still grows and flowers like clockwork. At the moment there are a few yellow fruit on it which also adds to this plants attractiveness. Glad to hear from another Rhipsalis fan. Your plant sounds as if it really likes its location, although you would be amazed what a few prills of controlled release fertiliser will make to your plant. They survive on nothing but respond immediately to nutrients. R. baccifera is a widespread species, popular in cultivation – however there are many different forms of it in cultivation and they can have quite different growth habits. I have a few different clones. I have seen images of one with red new growth being grown in Europe. I hope someone is growing it here, as I would dearly love a cutting! The lesson here is if you are offered a plant take it and grow it on – it may look similar but grow very differently. Arno thanks for sharing your knowledge in this article it is insightful and informative. Loved reading about all that rhipsalis, Arno, and my heart swelled when I read they are suited best to tropical and semi tropical climes …. hooray. I particularly like the groundcover effect . Are they easy to locate? 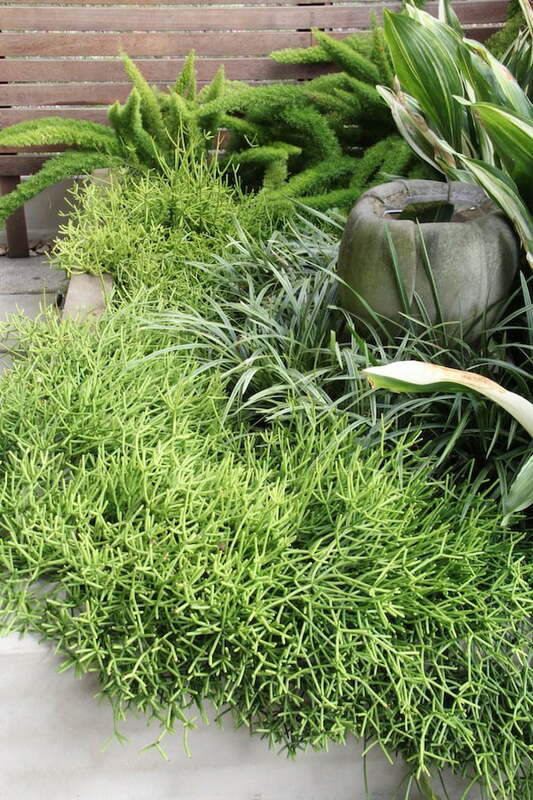 Yes many Rhipsalis make exceptional ground covers – particularly on banks in dry semi-shade. 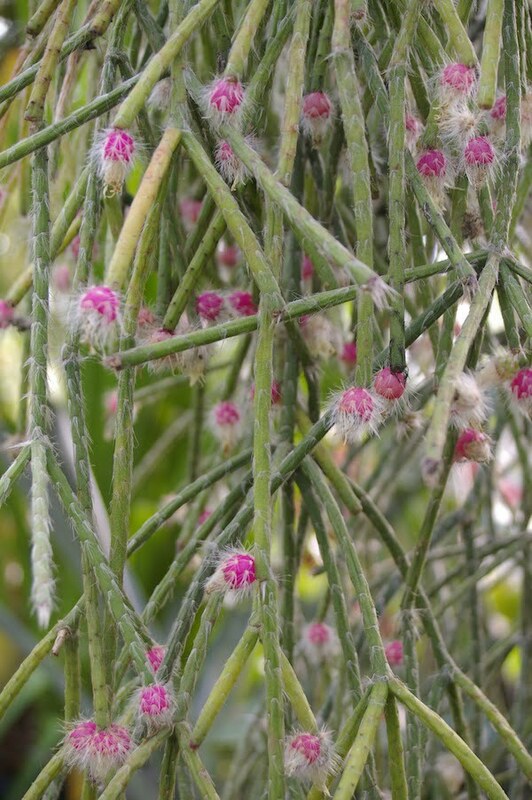 Regarding availablity – I see one or two in the garden centres in Queensland (Rhipsalis cereuscula, pilocarpa etc), but not as many as in the southern states. However I expect we will see more. I hope this article will inspire people to ask their garden centres to stock these plants as they are available from many wholesalers across the country. Keep your eyes peeled when visiting gardens and Garden Shows, and go to some of the displays put on by various Cacti and Succulent societies – as plants are usually available there. Finally we have the internet. If you know what you want, any plant is at your fingertip and delivered straight to your door. Instant gratification! glad to hear I have inspired you to try a few more of these interesting plants. They are very tough, as you noted – however their attractive weeping habit and textural form can be quite stunning in the garden, as Brendan Moar so skilfully demonstrated. I have just popped down to my local – Brookfield Garden Centre – and they have some 8 species for sale – all labelled with species name. I’m sure you will be able to track some more down in your locality. I would like to split it and repot it,,,,,, would orchid potting mix be ok? I also have another plant that had square branches and almost looks like old fashion armour, with links between each new growth,,,, I have asked many garden centres to name it,,, so far no results,,, any suggestions where I could try… I live in the Redlands area by the bay…. my apologies, I have only just spotted your comment. Its great to hear you are growing these wonderful plants. Regarding potting media, yes orchid media is great. I would recommend using Cymbidium orchid media as it holds just a fraction more moisture, and this may be helpful if the plant is hanging from a tree. Regarding your mystery plant, its hard to identify from your description, however I wonder if it might be Rhipsalis cerioides or R. pentaptera. Both are widely grown in South East Queensland. I’m sorry to hear you haven’t been able to track down some Rhipsalis plants. I have seen many different species of Rhipsalis in my local nurseries in the last few years and have been impressed with the selection available. A number of wholesale nurseries are growing these plants so there is no excuse for retailers not to be stocking them. 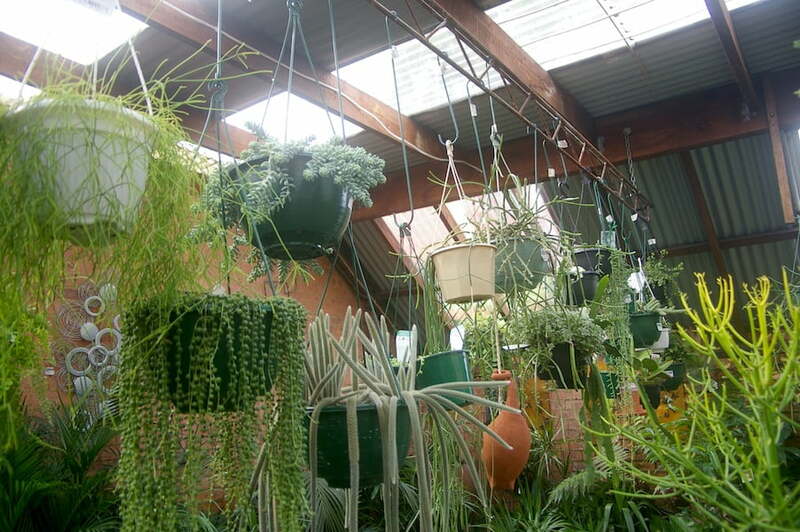 One of the growers with the biggest range of Rhipsalis is wholesale nursery Calara Cacti and Succulents at Palmwoods. Any garden centre will be able to buy in a selection of plants from them. They also have stands each year at the Brisbane International Garden Show (Pine Rivers Park, Strathpine 8-11th October) and Queensland Garden Expo (Nambour in July). Another place to get plants is at the Cacti and Succulent Society of Queensland Annual Show on Queens Birthday Weekend in June each year. Keep hunting – they are out there. Your biggest problem will be deciding which species to grow. Very interesting article Arno. Thanks. Growing Friends Nursery at the Royal Botanic Gardens Sydney now has a great range of Rhipsalis for sale. I know a couple of the Friends have become quite obsessed with growing them. The Garden Centre at Newtown also has lots of plants for sale so Sydney gardeners are quite spoilt. I’ve noted that Rhipsalis are often incorrectly named in Australia and the Friends and other keen gardeners might like to check out the website below to identify their plants. Its surprising how many species, varieties and cultivars are in the country. Knowing the name, origins and habitat of these plants helps with cultural practises and makes gardening a lot more interesting. I note that R. clavata, a common species is often labelled as floccossa or tucumanensis. I’ve been taking photographs of my plants over many years including flowers and fruit and intend to write a follow up article on some of the more popular species. I have a rhipsalis that is about 4″ tall and has barely grown in 11 years. Is this normal? It is a beautiful leaves and had never bloomed. Wish I could post a picture so someone could tell me what type of Rhipsalis it is. Thanks for giving us all your responses. You mention slow release. Which is the best please?